As a nutrition communication consultant I occasionally write about topics related to the food industry clients I may serve, but my blog topics, thoughts and opinions are my own. 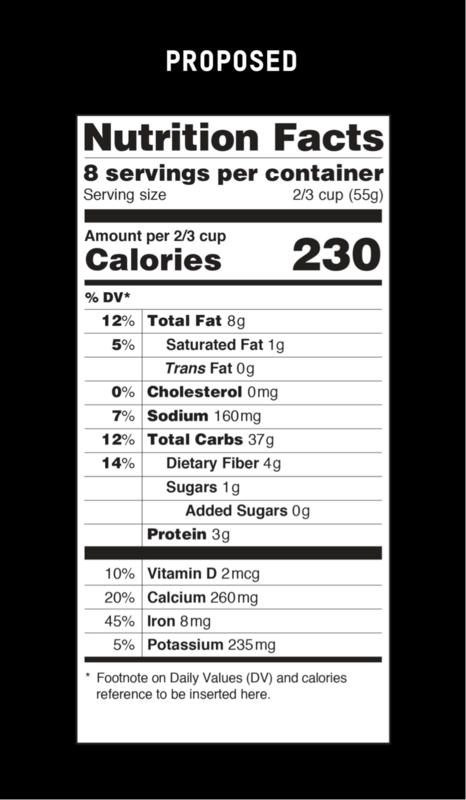 I introduced you to my opinions on the proposed changes for the Nutrition Facts label. Now let’s take a look at what those changes could be. There are a few changes to the nutrition label that I do support: Realistic serving sizes; highlighting calories; and changes in fat labeling. A good example of currently flawed serving size labeling is a 20-ounce bottle of soda that lists 8 ounces as a serving. The majority of folks who purchase a 20-ounce bottled beverage are going to drink the whole thing, so the proposed labeling changes would require the entire bottle to be labeled as “one serving”. I’m also okay with the new label proposal to remove the “calorie s from fat” line, as this information was never too useful, but Total Fat, Saturated Fat, and Trans Fats will continue to be on the label. Finally, making Calories more prominent will hopefully help cue consuming reduced portions of calorie-dense foods. Sugar is one of the big three changes to the label. As opposed to the current label that lists Total Carbohydrate and Sugars, the new label proposes that an additional line labeled “Added Sugars” be included. If I were to ask you: Which foods have added sugar in them? Perhaps – cookies, candy, soft drinks, juices, and bakery items would come to mind? So you already have a pretty good idea which foods have added sugar right? Sugar is sugar; even critics of the soft drink companies acknowledge that. The calories in soft drinks are from sugar. Thus, the sugar in them is actually expressed in a more meaningful and prominent way through the calorie labels, which is already in place. Forcing companies to list sugar as many as three times could also mislead consumers about how much sugar is actually in a product (not to mention the carbohydrate and sugar that’s already on the label anyway). As mentioned, there’s no question products such as regular soda provide sugar, but overall sugar intake is decreasing. CDC data shows added sugar from soda is down 39% since the year 2000. Sugar-sweetened beverages account for only 6% of calories in the average diet, according to government data. The proposed Added Sugar labeling is almost intentionally trying to leave the impression that products contain far more sugar than they do, and also draw attention to products with some added sugar that really aren’t playing a significant role in harming your health. Finally, what will we do with this Added Sugar information? We’ve been down this road. The guidelines regarding how much sugar we should consume daily are fuzzy. The American Heart Association recommends only a maximum of 100 calories of added sugar daily for women, and 150 added sugar calories for men. The Institute of Medicine recommends that no more than 25% of your calories should be comprised of added sugar. As a nutrition professional, I can’t recommend a one-fits-all strict guideline without considering age, size, medical history, and activity levels. In my opinion the only thing that will come from adding the words “Added Sugars” to a label is more hysteria over sugar in the diet, leading to more disordered eating and perpetuating more nutrition misinformation (via misinterpreting a food for a dietary pattern). 1. Will the Added Sugars line on the label help you reduce the sugar in your diet, or are you already aware of the sources of added sugar in your diet? This entry was posted in Food Facts, Misc and tagged fat, FDA, food labels, nutrition facts, nutrition guidelines, sugar, sugars by Rosanne Rust. Bookmark the permalink.